Born in Swansea, Tony started his career with Stockport County as a 19 year old goalkeeper, but failed to break into the first team. He went on loan to Wigan Athletic before joining them on a permanent basis in July 1991. 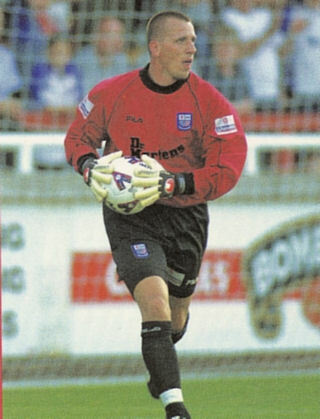 After just 10 appearances, he moved to Hereford United in the July 1994, where he stayed for one season before joining non-league Yeovil Town becoming their first choice keeper. Tony spent six years with the Somerset side, and had the honour of scoring once during his tenure and he also played for the Welsh semi-professional side. 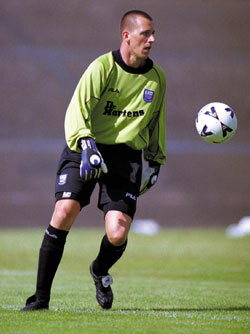 On 6 June 2001, he joined Rushden & Diamonds as No.2 to Billy Turley and made his debut after Turley’s dismissal at Leyton Orient in September 2001. He went on the play a further six games for Diamonds, but lack of first team action saw him go out on loan for the remainder of the season on 14 February 2002. He joined Farnborough in the summer, but after one season, he returned to Wales to join Carmarthen Town in July 2003. After two seasons, he moved to Newport County in October 2005, but a broken leg at the start of the 2006/07 season saw him out of action for the remainder of the season, and he took up a coaching appointment with Swansea City. During 2007, he managed the Welsh semi-professional side, following which he took up the managers position at Port Talbot Town. His stay was short lived, and he returned to Newport County in November the same year. In July 2008, he became Head of Youth Development at Swansea City, and is still registered to play as an emergency keeper if required. He went into coaching, most notably with Hull City where he was first-team coach until early 2017, returning to the role in June of that year, and remaining there for the 2018/19 season as the club had various managerial changes.